The Areni-1 winery is a 6100-year-old winery that was discovered in 2007 in the Areni-1 cave complex in the village of Areni in the Vayots Dzor province of the Republic of Armenia by a team of Armenian and Irish archaeologists. The excavations were carried out by Boris Gasparyan of the Institute of Archaeology and Ethnography of the National Academy of Sciences of Armenia and Ron Pinhasi from University College Cork (Ireland), and were sponsored by the Gfoeller Foundation (USA) and University College Cork. In 2008 the University of California, Los Angeles (UCLA) also joined the project. Since then the excavations have been sponsored by UCLA and the National Geographic Society as well. The excavations of the winery were completed in 2010. The winery consists of fermentation vats, a wine press, storage jars, pottery sherds, and is believed to be at least a thousand years older than the winery unearthed in the West Bank in 1963, which is the second oldest currently known. Excavations at the Areni-1 site began in 2007 and continued until September 2010, when Armenian, American and Irish archaeologists fully unearthed a large, well-preserved 2-foot (60 centimeters) deep vat, along with a 3.5-foot (one meter) long basin made of clay and covered with malvidin. In addition to these discoveries were found grape seeds, remains of pressed grapes, prunes, walnuts, and desiccated vines. A number of drinking cups, found next to a set of ancient graves, were also excavated, suggesting that the site was used for funeral ceremonies and ritualistic practices. The cave was abandoned after its roof caved in, and the organic material was preserved thanks to sheep dung, which prevented fungi from destroying the remains. The preliminary results of the Chemical analysis of the residues from the bottom of the wine-press and the storage jars were published in the Journal of Archaeological Science in January 2011. Botanical analysis and radiocarbon tests carried out by researchers at the University of California, Irvine and Oxford University have revealed the date of the Areni-1 winery to around 4100 BC and 4000 BC or the Late Chalcolithic Period. According to Areshian, the vintners used their feet to press the wine in the clay basin, the juice of which would then drain into the vat, where it would remain to ferment until being stored in jars. The capacity of the vat has been estimated to be about 14-15 gallons. 1 2 3 Maugh II, Thomas H. "Ancient winery found in Armenia." Los Angeles Times. January 11, 2011. Retrieved January 14, 2011. 1 2 3 Santini, Jean-Louis. "Scientists find 'oldest ever' winery in Armenia." Agence France Press. January 11, 2011. Retrieved January 14, 2011. 1 2 3 4 Owen, James. 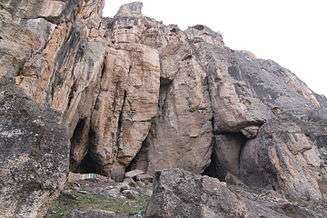 "Earliest Known Winery Found in Armenian Cave." National Geographic. January 10, 2011. Retrieved January 14, 2011. ↑ Belluck, Pam. "Cave Drops Hints to Earliest Glass of Red." New York Times. January 11, 2011. Retrieved January 16, 2011. ↑ Squires, Nick. "World's earliest known winery discovered in Armenia." The Telegraph. January 11, 2011. Retrieved January 14, 2011. Oldest Wine Press Found In Armenia, RFE/RL Video, January 17, 2011.